When you update linux kernels in ubuntu, the old linux kernel version is not deleted and it also appears in your boot menu. 1.First, find which kernel you are using to avoid the deletion of current linux kernel version. Open the terminal. To open terminal go to Applications->Accessories->Terminal and Type the below command and press enter. Note your current linux kernel version. 3.Type linux-image in Quick search field. 4.Your old linux kernel package being with linux -image and the green selection boxes are currently installed versions. 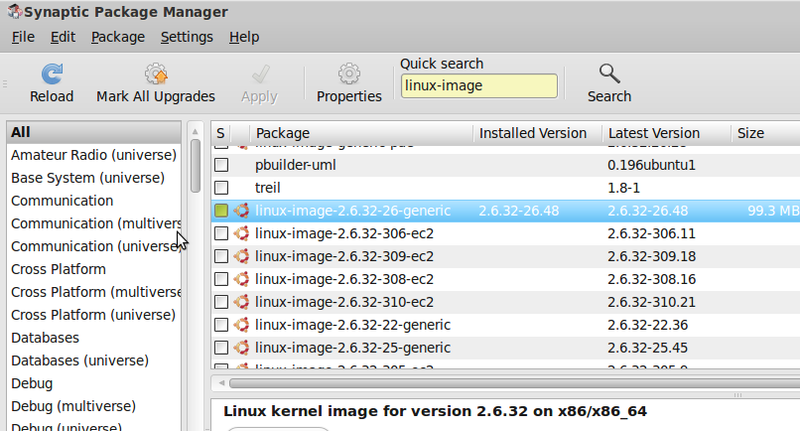 If 2.6.32-32 is your current linux version then linux-image-2.6.32-25 is older than linux-image-2.6.32-26. 5.Right click in your old version select mark for complete removal and click apply. may i ask, you forgot another steps, after complete removal, open terminal and do command “sudo update-grub2” and restart.